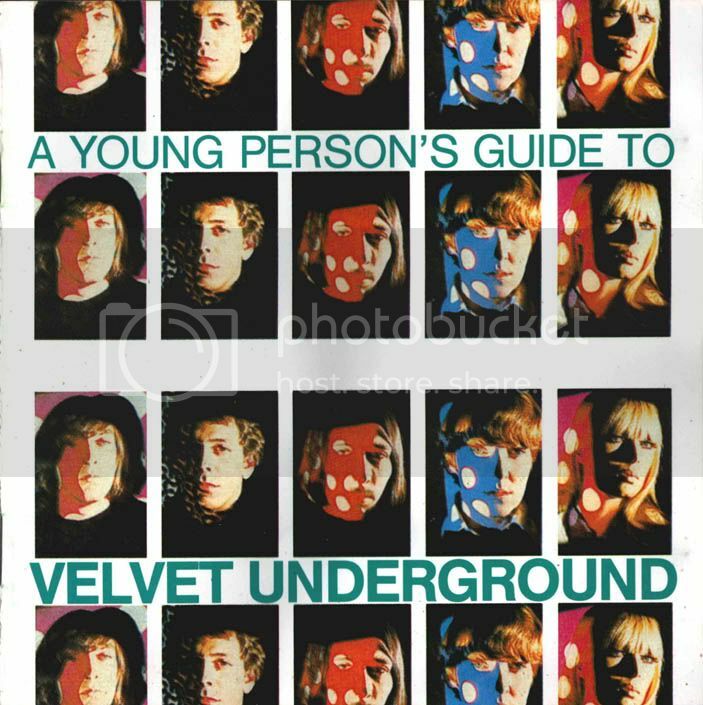 "A Young Person´s Guide To Velvet Underground" is a collection of various rare cuts, pre-Velvet-Underground tracks, studio demos and Max's live tracks. It comes with an 8-pages photo book and covers the early years of VU. The included song "Waves" was the working title for "Ocean". 1, 3, 4 : rough mix acetate demos / 2 : mono mix, 1967 / 5, 6, 13 : pre-VU tracks / 7 : Andy Warhol's Index book flexi / 8 : The East Village Other LP / 9 : Max's Kansas City, August 23, 1970 / 10, 12, 14 : Max's Kansas City, July 26, 1970 / 11 : Max's Kansas City, rehearsals, Summer 1970. Thanks again! Another great compilation of rare VU. What a great band. Thank you for this & all the great music you share. A job well done! Thanks a lot for your comments. Best wishes! All of your Velvet Underground posts have been great and carry me back decades to when I first heard "Heroin" and "I'm Waiting For my Man" in my mid-teens. I was mesmerized by them and instantly became a Velvet Underground and, when they began their individual careers, Lou Reed and John Cale fan. Until then my musical taste was chiefly soul and jazz but the Velvet Underground's music was hypnotizing and unique. Fortunately, my best friend in college was a fanatic follower of the band and I became very familiar with their and Lou Reed's entire catalogue, including his and Cale's marvelous homage to Andy Warhol, "Drella". I often wonder if artists like Patti Smith and Alejandro Escovedo would have developed their unique musical style and the brilliant poetry of their lyrics had the Velvets not appeared in the 1960s. All those decades ago I don't recall the Velvets' music being so popular anywhere other than on what we called the underground stations but their musical influence was enormous. Many thanks for presenting the best of American music during that era. No song better captured what it was like to live during that era of musical exploration and diversity than Reed's "Rock And Roll". In the 1970s and 1980s, music would become become categorized and segregated by genre on radio playlists. But for the playlists of a few college stations, one could no longer find stations that would play the Velvets, Chambers Brothers, Miles Davis, Exuma, Joan Baez, Jimi Hendrix, the Fugs, Pearls Before Swine, Electric Flag, Elizabeth Cotton, and an eclectic mix of other artists as an inclusive set list. As a parent, I made a concerted effort to expose my children to a similar mix of genres to offset the limitations and parochialism of commercial radio; however, we are so fortunate today that a few blogs such as yours serve as our radio stations because what is past on radio is past. One can't recreate it or wallow in nostalgia. Thanks for all that you do; it is unique. The Modern and Fashionable Karachi call girls are Available for the individuals who need a sidekick and Pleasure We present to you a portion of the best Models buddies Escorts in Islamabad who are Professional as well as all around. Pakistan Best Islamabad Escorts Agency Offer The Most High Profiles Well Educated Good Looking and Full Cooperative VIP Model Services they are Independent and Provide Very Comfortable Service Cheap and Excellent service.